I was really craving pancakes for breakfast yesterday morning when I remembered these Blueberry Orange Cornmeal Pancakes I read about on Satisfied, a new-to-me food blog written by Chef Louise Mellor. I’m so glad I had bookmarked the recipe because these pancakes were fantastic! 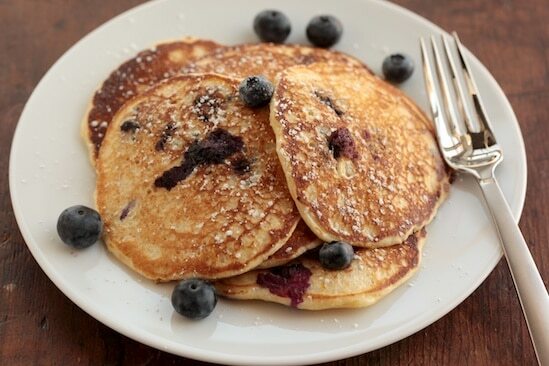 These are buttermilk pancakes spiked with vanilla and orange zest, and studded with fresh blueberries. A small amount of cornmeal adds a fun texture to the batter but doesn’t weigh it down. The pancakes turned out light, fluffy, and flavorful – exactly what I was looking for. But if pancakes aren’t your thing, how about Sumac Roasted Chicken Breasts with Chickpea Couscous with Apricots, Currants, and Cherry Vinaigrette? Or perhaps dessert is what you’re craving – here’s a recipe for Coffee Hazelnut Brownies with Salted Caramel Sauce that should satisfy. Have you been looking for a great fresh strawberry ice cream recipe? I know I have. Well, check out this ultra-rich Strawberry Buttermilk Ice Cream. It’s been added to my list of recipes to try soon! I hope all those delicious-sounding recipes haven’t distracted you from the pancakes. They were wonderful and I don’t want you to forget to bookmark the recipe. What new (or new-to-you) food blogs have inspired you lately? Feel free to share links in the comments section below. Happy Food Blog Friday! No such thing as a wrong way to make pancakes. I really like this feature you post. I love finding new blogs and you always seem to have some I haven't seen before. Thanks. Just this morning I requested pancakes for breakfast! They're my favorite. The new-to-me site that's inspired me a lot lately is Georgia Pellegrini's: http://georgiapellegrini.com/. Thanks for the recipe! Those look like perfect Sunday morning pancakes. Thanks for the intro to the new blog too. Have a good weekend. Kristian - Thanks for the suggestion - I'll check it out! I have some blue cornmeal in my pantry...I might try using it in these pancakes. I love a good cornmeal crunch! Hmm...new food blogs? Dorie Greenspan has had a few posts on new food blogs that I've enjoyed. You might check out her last few posts. But your food blog is new to me and I'm enjoying it very much! Thanks! :) I just saw someone else recommended Georgia's site. I just found it today too! Good news travels fast! Wow, I have to try this recipe. Pancakes are amazing and I loves me some for sure. I will see if I can lower the calories a bit and maintain a healthy nutritional balance, but these seem on the money as they are. They'll be great with my favorite low calorie syrup. Thanks for the recipe! I love pancakes. I've been on a pancake kick for the last few weeks. I know what's for breakfast tomorrow. Oh, and I love the idea of featuring other blogs. Brilliant as usual. cornmeal? I am so intrigued I am starring this recipe - will try it soon! I love your photos, those pancakes look incredible and just about perfect :) Whenever I try to make pancakes the bottom always gets browned too unevenly, can't figure out why, LOL.